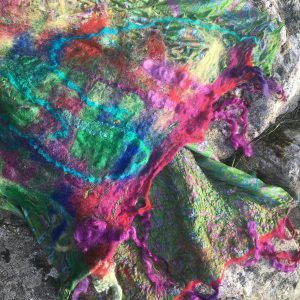 One week of beautiful felting workshops in a stunning chalet and Meditations for beginners and experts( https://www.chaletnantailly.fr) in the French Alps. 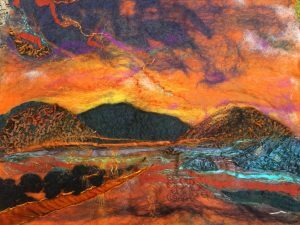 “I would like to congratulate Debra and her support team for providing such a wonderful artistic, soul satisfying, total experience. The location, the accommodation and the hospitality was a true value for money. 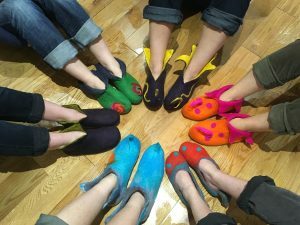 Like minded participants completed the whole environment towards a memorable, rewarding experience. It is a holiday destination for many, especially those seeking peace and quiet and who enjoy nature and the natural beauty of the Hebrides. 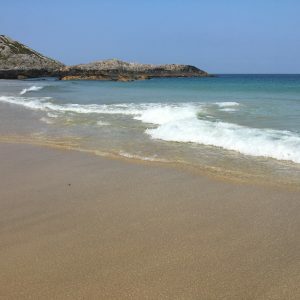 It boasts the sunniest climate in the British Isles and has some of the most beautiful beaches in the world. 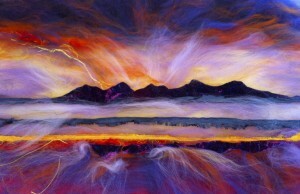 The quality of the light, the ever-changing cloud and seascapes and the raw beauty make this an inspirational venue for any artist. With only 200 permanent inhabitants Coll is a true get-away-from-it destination. 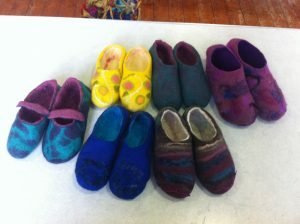 I am offering a week of full board incorporating 6 varied felting workshops. 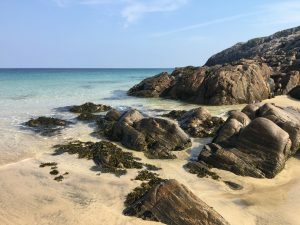 We will be staying in a luxurious Hebridean hideaway surrounded by wild inspiration (click here to see the accommodation) plus daily meditations with an introduction into mindfulness. Simple Yoga sessions may also be a possibilty for those wishing to do so. The week will include breakfast, lunch and evening meal (excluding last night and one lunch where we will dine out – price not including these meals) prepared freshly by an in-house chef. Those who like an alcoholic drink (or two) will be asked to contribute towards this. I want your holiday to be a mix of inspiration, relaxation or motivation depending on what you want to gain from the experience. Arrival on Monday morning on the early ferry from Oban (see Getting There below). You will be collected and driven to a stunning location near to one of an array of the most beautiful beaches in the world! Welcome lunch while we get to know one another and you will be given a beautiful assortment of fibres wools and silks and a journal with pens / pencils etc. There will be an opportunity for a short walk to the beach, all weathers produce stunning light. 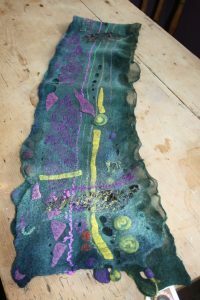 In our first felting session we will make a lovely journal cover. 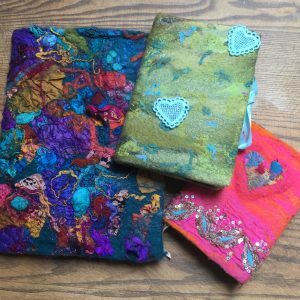 You will be encouraged to fill your journal with sketches, poems, private musings, sea shells, in fact anything at all inspired by your stay or that makes your heart sing! We will have an optional meditation class at 6pm to introduce you to my mindful way of working which I hope will both ground and inspire you. After aperitifs, dinner will be served around 7pm and there will be plenty of free time afterwards to unwind with new friends or there are plenty of warm snug spaces in the house in which to retreat . Optional meditation at 8am followed by breakfast. 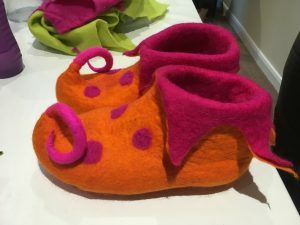 I will teach you how to nuno felt incorporating all kinds of delicious fibres, silks and wools into your felt. Your first piece will be abstract. 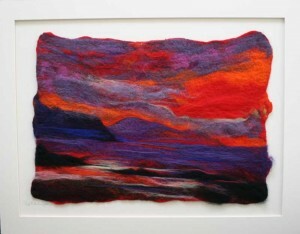 This will then be used later in larger pieces of Felt landscapes hopefully inspired by the Island. 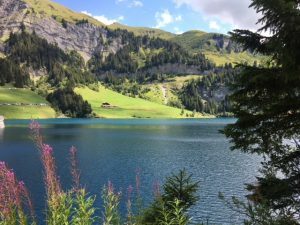 A long lunch break will give you the opportunity for a walk (or swim!) or a good rest. 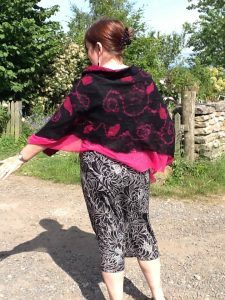 I will show you how to use nuno felting again to make clothing, in this case a scarf but she can advise for future clothing pieces. 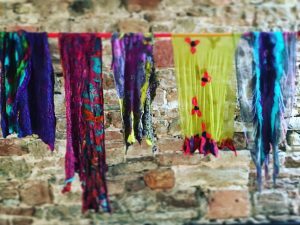 You will use finest Italian chiffons , sari silks and merino wool. A morning of free time to discover the Island either on foot or we can go on a tour with lunch at a local restaurant. 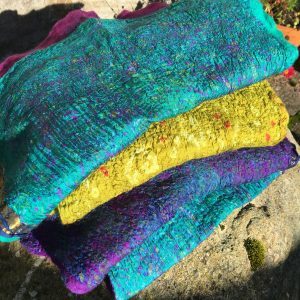 An introduction into working with resists. 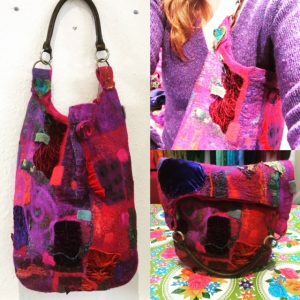 I will teach you how to use 3D resists with no sewing to make a strong but stunning shoulder bag which will be the envy of all your friends. Dinner at the only PUB on the Island where there is delicious sea food and often live traditional music. Breakfast and departure for a midday ferry crossing. Balance is due 30 days before departure. Limited spaces up to 8 depending on sharing rooms – (4 Double rooms for single occupancy and 2 rooms for two sharing. 30% non refundable deposit (please take out holiday insurance to cover you for cancellation due to illness) If you have to cancel before 60 days to departure I will transfer your place to another course if I can fill the space. 70% balance due in April. 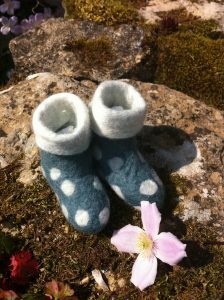 One week of beautiful felting workshops in a stunning chalet ( https://www.chaletnantailly.fr) in the French Alps. Arrival – After you have settled into your rooms, we will do a small meditation to ground ourselves followed by Cocktails and delicious food. All workshops will be 5 hours with a three hour break for lunch and walks/rest. 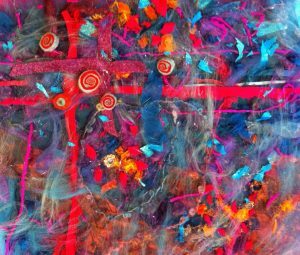 Day 1 – You will learn how to nuno felt for felt art using debra’s technique of “Wild Abandon”- a mindful practice of abstract art. 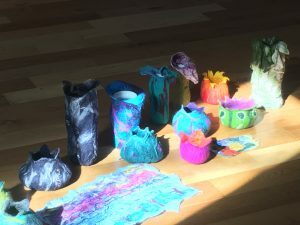 This will be followed by making a journal cover out of felt and an introduction to art journalling to begin a creative journey, inspired by the flowers and fauna seen around the Chalet. 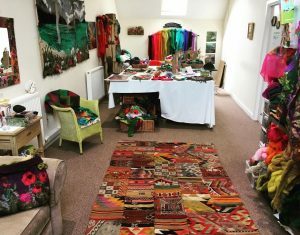 Day 2 – You will make a beautiful nuno felted scarf/shawl using finest merino wool and silk saris to wrap around your shoulders in the evening whilst drinking Pimm’s in the garden. 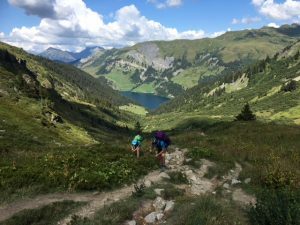 Day 3- Tour of local area with possible hiking for those wishing something more strenuous or just amble around the local market and town with time to sketch and ponder French life! 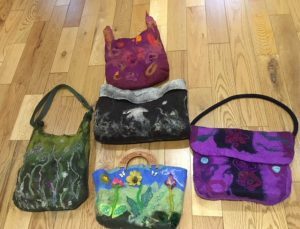 Day 4– You will make a beautiful handbag with a large selection of different fabrics laid into your felt , this will be the envy of all your friends and will last forever. 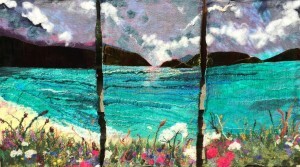 Day 5– You will make a breathtaking piece of felt art- landscapes inspired by the fabulous views surrounding you all week. 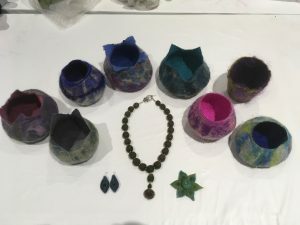 Day 6 -Jewellery , Vessels. 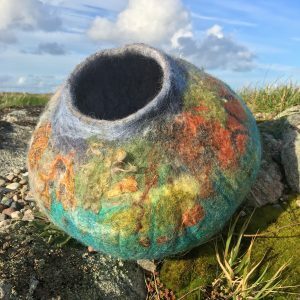 You can make a selection of beads for earrings, bangles and large rings all with felt. 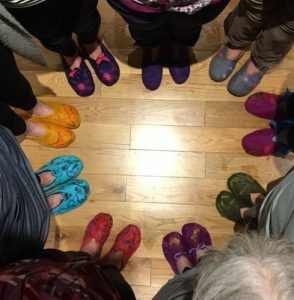 In the evening we will dance to celebrate a fabulous week of co-creating ! 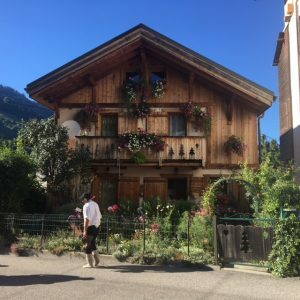 All materials and meals are provided (except Wednesday where we will sample a local restaurant) consisting of home-cooked delicious, locally sourced ingredients. Continental style freshly baked breakfasts. Buffet style Mediterranean lunches and two course Dinners. Transfers to and from airport are also included- Flights are not included but flights will be to Geneva airport .- I will post links soon. PLEASE EMAIL ME FOR MORE INFO……. 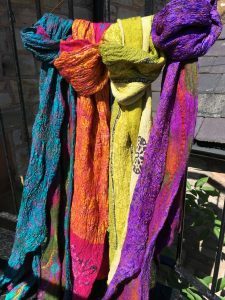 I also offer weekend and week long wellbeing retreats in the Lake District -using different aspects of felt making to bring about wellbeing. Please contact me for dates this year. 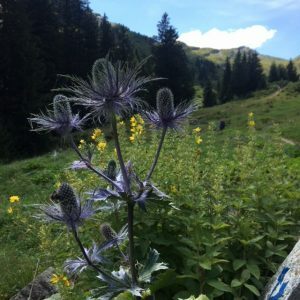 I use techniques to reduce anxiety, both personal and work related. My background is in Psychology and I have a huge interest and experience of wellbeing and anxiety reduction. 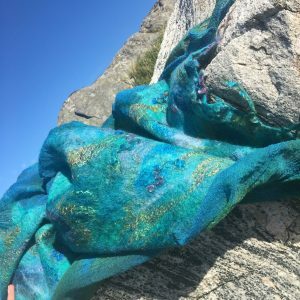 The retreats offer Felt making, mindfulness/meditation techniques, yoga, nutritional and psychological advice and are held in my studio and around the Lake District.